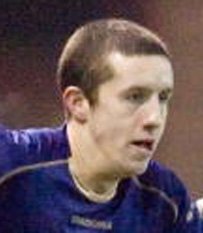 Ryan Conroy is of course a recent addition to the Palmerston Park first team squad list. Part of Conroy’s playing background is a group of players who have since been something of recruitment ground for Queen of the South - the 18 man Scotland squad that finished runners up in Poland in the 2006, under 19 European football championship. 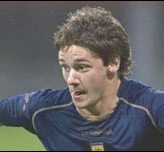 Jamie Adams was a centre back for the under 19s and first appeared in the finals in Scotland’s first game, a 2-2 draw against Portugal. Adams came on as an 80th minute sub for Michael McGlinchey. Adams then missed the next game, a 4-0 defeat to Spain before appearing throughout Scotland’s remaining games – the 3-2 win against Turkey, the 1-0 semi final win against Czech Republic and the 2-1 final defeat to the Spain team of Gerard Piqué, Juan Mata and Javi Garcia. Adams has turned out for the Palmerston club in four loan spells where his ability on the pitch has primarily been undermined by his unavailability due to injury. He first signed on at Palmerston from the same bout of negotiations that resulted in winger Willie Gibson leaving Queens for Kilmarnock. It was also Adams who inadvertently became involved in a subject of some controversy at Palmerston. Adams was team sheeted by then manager Ian McCall during the 2006-07 Scottish Cup run, playing in the ties against Cowdenbeath and Hibs. The SFA took unkindly to this since Adams had been listed as a sub in the third round for Killie and so was deemed to be ineligible. Queens were hit with a fine to the tune of 20 grand – peanuts to some clubs but not to cash strapped Queens. Davie Rae said of the fine, “It`s a substantial sum”. In Adams` time at Queens he has clocked up 22 league appearances and a couple of Scottish Cup appearances. Ryan Conroy’s first appearance in Poland was in the 4-0 defeat to Spain when he joined the fray as a 53rd minute sub for Mark Reynolds. Conroy started the game against Turkey and scored his side’s opener in the 42nd minute. He also started in the semi and final games and in all three games he started he was subbed at some point in the last 15 minutes. After his debut Palmerston goal two weeks ago against Ross County, Conroy has to date played three games for QoS in his loan spell from Celtic. In the final the player taking Conroy’s place was another future Doonhamer, Brian Gilmour. Gilmour’s 78th minute subs appearance was his only participation in the finals. Gilmour was at Queens for season 2007/08. Queens’ best season for decades, Gilmour’s 27 appearances were predominantly in the first half of that season. In the run to that season’s Scottish Cup final he played in the early round emphatic wins against Peterhead and Linlithgow Rose. In the second half of the season, Gilmour was rarely able to achieve any game time as Gordon Chisholm largely stuck with a settled and in form side. Since leaving Queens Gilmour spent one season with Finnish outfit FC Haka and spent last season at Lincoln City. While Gilmour was in Finland, Haka were in the same 2008/09 UEFA Cup qualification second round draw as Queens. However, like Queens, Haka were drawn to play against Danish opposition. Thus Gilmour ended up playing against Brøndby. Haka endured a similar fate to Queens as the Danes won home and away. Gilmour missed the 4-0 defeat in Western Finland but played in the second leg 2-0 defeat in Copenhagen. 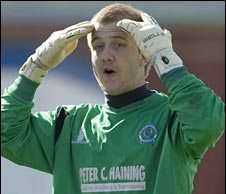 Scott Fox was back up goalkeeper in Poland for the Scots but had no greater participation in games than warming the bench. Fox joined Queens in January 2010 providing goalkeeping cover once again and featured in six league games before his departure at the season’s end. All four players featured above played for Scotland in the 2007 FIFA U-20 World Cup finals played in Canada. Fox started once and Gilmour played once as a sub. Conroy made two subs appearances added to one start. Adams was a starter twice after being ineligible for the first of Scotland`s games. There was no repeat of the success of the previous Summer as this time the Scots were eliminated at the group phase from games against Costa Rica, Nigeria and Japan. As for some of the others who have yet to feature for Queens. Michael McGlinchey has the distinction of having been selected for a squad for the 2010 South Africa World Cup. FIFA selection criteria changes meant he was able to defect to the nation of his birth, New Zealand. Prior to this season semi final goal scorer, Calum Elliot, had yet to set the heather on fire at Hearts but did have a successful loan spell at Livingston. It was when at Livi that he stunned the world on youtube.com with what diplomatically may be described as a remarkable line in self choreographed home dancing. This season he has scored three goals in three league games for Hearts. Also at Hearts is Lee Wallace who has done well establishing himself as a first team regular and becoming a fixture of the senior Scotland squad under Craig Levein. However Wallace was subbed playing for Scotland against Liechtenstein last week when he picked up a serious knee injury. The player highlighted as Scotland’s `one to watch` from Poland was then Hibs striker Steven Fletcher. Fletcher has since been the subject of two multi million pound transfers and currently plays in the English Premier League for Wolves. Graham Dorrans was used as a sub in Poland and scored after coming on in the final against Spain. After leaving Livingston for West Brom, Dorrans has attracted many favourable reviews with The Guardian reporting of him in March, "Composed, creative, combative and consistent, Dorrans is easily the best all-round midfielder seen at West Brom since Bryan Robson." Dorrans is another to establish himself in the senior Scotland squad. Robert Snodgrass, like Dorrans, was at Livingston. Perhaps even more puzzling than Elliot’s dance routines, Snodgrass declined the invitation of a trial with global megaweights, FC Barcelona. Snodgrass since has flourished at Leeds United picking up a succession of individual awards thanks to his on-field imaginative flair.